Once upon a time when I was in college, I had the privilege of working at Cocolat, Alice Medrich's famed Northern California chocolate dessert shop. Although Alice had sold her share in the company by the time I joined, she was still present in the simple yet decadent confections that filled the pastry cases each day. Her brilliance with all things chocolate made her a superhero to me, and any time she popped in to the shop -- in the flesh! -- to pick up a torte or truffles, I'd go weak in the knees. In the years since, I've made many of Alice's creations at home using recipes from her beautiful books. Of course they're never quite the same as the treats from my Cocolat days, but they never disappoint. So when this month's Bon Appetit magazine arrived with a stash of new cocoa-based recipes from Alice, I knew exactly what to do: whip up a batch of her Cocoa Brownies with Browned Butter and Walnuts. Immediately. 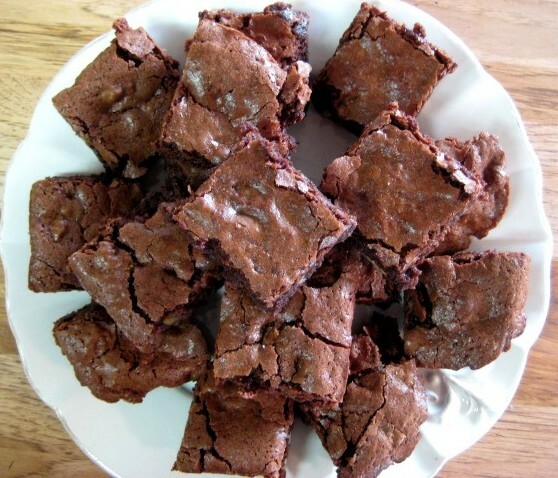 Bon Appetit's editors describe these as "some of the best brownies we've ever had." Of course they are! If you're tempted to tweak and doctor Alice's deceptively simple recipe, don't. 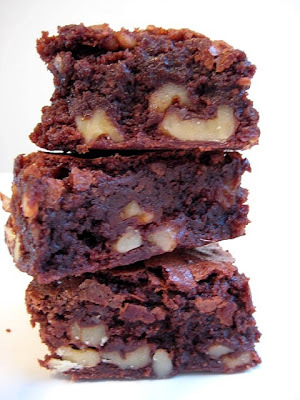 She knows what she's doing, and her brownies are perfect as-is -- even if, like me, you don't usually care for walnuts in your brownies. The nuttiness of the brown butter is enhanced by the walnuts, which themselves make for a satisfyingly toothsome bite. But if you absolutely insist on making another batch with globs of Nutella swirled on top, I won't stop you. Either way, they make a perfect Valentine's Day treat.